According to Amy Jen Su and Muriel Maignan Wilkins, leadership presence is the ability to consistently and clearly articulate your value proposition while influencing and connecting with others. In Own the Room, they offer a simple and compelling framework, as well as practical advice about how you can develop your own personal presence. Do You Know Your 'Signature Voice'? 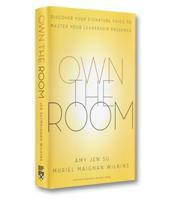 Own the Room, the title of a new book from executive coaches Amy Jen Su and Muriel Maignan Wilkins, is a wonderfully evocative phrase that conveys the full power and potential of leadership presence. To "own the room" is the ability to capture the attention of those around you, to fully engage everyone in that room, to make them want to listen to you and want to follow you. For many who have witnessed this kind of leadership presence, there is something almost magical about such power, not least because it is so difficult to define and explain. According to Su and Wilkins, founding partners of a Washington-based executive training and coaching firm, this very nebulousness of leadership presence leads to three destructive myths: you either have leadership presence or you don’t; you can just copy what others are doing; or once you got it, you always got it. These myths are destructive because they prevent leaders from improving (or even attempting to improve) their leadership presence. In Own the Room, based on extensive work with a wide variety of clients, the authors demonstrate that everyone can build up their leadership presence once they understand that such presence depends on what they call a signature voice. According to the authors, human beings are driven by two fundamental motivations: to speak for oneself and to speak for others. People with a stronger "voice for self" are better at speaking for themselves, for their functions and for their companies; other people, those with a "voice for others," are better at speaking for others — understanding their concerns and connecting with their needs. 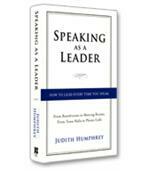 A voice for self gives leaders "the ability to demonstrate their value and distinction," write the authors. A voice for others gives leaders "the ability to connect and align with their stakeholders." When leaders know when and how to effectively use both of these capabilities, they have found their "signature voice." The challenge, of course, is adaptively using both voices. It’s not always easy. Under stress, those who tend toward the voice for self will slide into what the authors call a "driving voice"; likewise, those who tend toward the voice for others will slide into a "supporting voice." Both are important, write the authors, but they must be used at the right time and with the right strength. "It’s about strengthening both so you can use them agilely," the authors explain. 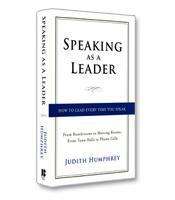 Achieving a signature voice depends on understanding that leadership presence is not just about speech. According to the authors, presence requires an alignment between mind, skill and body — specifically, your beliefs and assumptions, your communication skills and strategies, and your physical energy. These three elements — assumptions, communication strategies and energy — form the basis of the authors’ ACE integrated approach to presence. Filled with action steps supported by drills and two ongoing case studies, this book explains in-depth how to develop the right assumptions about the people with whom you interact or about the situation that surrounds you; master the techniques and tools that engage, influence and inspire others; and convey the right energy not just based on the way you look but also your nonverbal cues and the "vibes" you give off. Own the Room effectively dispels any notion that leadership presence is nebulous or ingrained. With the insight and tools offered in this book, if you don’t have presence, it’s because you never tried to get it.